A parliamentary panel, attached with the Petroleum Ministry, has called upon the government to restructure the excise duties on the petroleum products to neutralise the impact on the oil market companies of the soaring international crude oil prices. In a significant decision, the United States has terminated countervailing and anti-dumping investigations on imports of polyethylene terephthalate resin from India, Indonesia and Thailand. The government today informed the Lok Sabha that it would soon review the Drugs and Cosmetics Act to ensure stringent measures in the wake of reports that certain harmful chemicals are used in baby products. 2004-05, registering about 30 per cent growth over the previous year. US celebrity Paris Hilton flashes the victory sign to photographers during the launch of her perfume Paris Hilton Sheer in Tokyo. The Standing Committee on Finance of Parliament has expressed serious concern over deviations from the fiscal consolidation roadmap as laid down in the Fiscal Responsibility and Budget Management Act. Travel agents across the country have called off their 19-day agitation against Air-India and European carriers after getting an assurance from the A-I top brass that their grievances would be looked into. After taking on Chinese cycle manufacturers in the domestic market, Ludhiana-based Hi Bird cycles has decided to enter the Chinese market in a big way. Durban, April 20 The Chief Executive of a South African arms manufacturing company, Denel, which is under investigation for alleged corruption in a deal with India in 2003, has been sacked following charges of financial mismanagement. Haryana would lose Rs 700 crore, the year the central sales tax is reduced to 2 per cent and Rs 1,600 crore in the year the rate is brought down to zero. Collectively, the states would together lose over Rs 15,000 crore. India’s largest biotech firm Biocon Limited today posted net profit of Rs 198 crore and revenues of Rs 728 crore in 2004-05 and said, its profits in the current year would not grow as fast as sales but would maintain last year’s operating margins. Criticising Finance Minister P Chidambaram for hiking excise duties on petroleum products the panel advocated the need for continuing subsidy on PDS kerosene and domestic LPG beyond March, 2007, keeping the interests of the common man in mind. ‘’Any price reform in the oil sector should keep the interests of the customer in mind and attempt at rationalising the duty structure or adjusting the duty in such a way that cascading effect of international petroleum prices does not weigh down the customer,’’ the report said. The committee noted that certain changes were made in customs duty on crude, which has been reduced from 10 per cent to 5 per cent. Customs duties on LPG and PDS kerosene was reduced to nil and on petrol and diesel to 10 per cent from 15 per cent. Customs duties on other petroleum products were reduced from 20 per cent to 10 per cent. Similarly, the excise duty on PDS kerosene and LPG has been brought down to nil. But for petrol and diesel, excise tariffs comprise a mix of ad valorem and specific components, raised to 8 per cent plus Rs 13 per litre in case of petrol and 8 per cent and Rs 3.25 per litre in case of diesel. Though these changes were projected to be revenue neutral by the Ministry of Finance, the committee was astonished to see that it added an incremental revenue of Rs 3,000 crore per annum to central coffers. The committee said the changes in duties had resulted in an increase of Rs 2.52 per litre in petrol and Rs 1.65 per litre in case of diesel in excise duties. However, there was a reduction of Rs 17.75 per cylinder of LPG and Rs 0.88 litre of kerosene in excise. On the issue of continuation of subsidy on LPG and kerosene beyond March, 2007, the committee said the subsidies could be borne by the oil companies and a part could be financed from cess collected on indigenous crude. The committee said that between April-December,2004, about 91 per cent of the subsidy amount on PDS kerosene had been borne by oil marketing companies and only 9 per cent by the government through budgetary support. In case of subsidy on LPG, 85 per cent was borne by oil companies while 15 per cent by the government. Taking a cue from the Parliamentary Standing Committee report to nail its point, the CPM today accused the UPA government of indulging in statistical jugglery in the oil price front and demanded the government to a downward revision of petrol and diesel prices. A Parliamentary Committee today directed the Petroleum Ministry to appoint a high-level fact finding team immediately to scrutinise the Dahej-Uran Pipeline project deals and rapped the state-owned GAIL (India) for not taking a decision on the Presidential directive to cancel the tender of the project. The Standing Committee on Petroleum and Natural Gas has also asked the Ministry to submit its fact-finding report within a fortnight. The DUPL project has run into rough weather following issuance of a Presidential directive to GAIL to cancel its tender for the project and issue fresh tenders for commissioning the pipeline. The committee also expressed surprise that the GAIL did not suo motu cancel the tender for the DUPL, which had specified only LSAW pipes even after the findings of the Centre of High Technology (CHT) came to notice. The DUPL project, which was scheduled to be commissioned in February, 2005, ran into controversy after GAIL opted to use longitudinally submerged arc welded (LSAW) pipes for transmission of the natural gas, instead of helically submerged arc welded (HSAW) pipes. Both pipes are equally good for gas transportation, the committee noted. Following the controversy, the Government has referred the matter to the CHT, which has recommended that since both LSAW and HSAW type pipes are used for gas transportation internationally, both should be included in the tender documents. In a significant decision, the United States has terminated countervailing and anti-dumping investigations on imports of polyethylene terephthalate (PET) resin from India, Indonesia and Thailand. The US International Trade Commission (USITC) rejected the local PET resin industry’s plea to impose anti-dumping duties against Indian imports in a 5-1 vote, saying it found no reasonable indication that such imports hurt domestic industries. With the decision, anti-dumping and countervailing duties, which were temporarily imposed by the US Department of Commerce pending this final determination, will be lifted by the US Customs Service within the next few days. The negative preliminary ruling came on Monday after a stiff fight and, in the end, the ITC determined that the US imports of PET resin from India did not injure or threaten future injury to the American PET resin industry. “This is a great and significant victory for Indian producers of PET resin. It is a prime example of how strategic and constructive engagement in the US trade proceedings can yield positive results,” said Ambassador Susan G. Esserman, counsel to Reliance Industries Ltd., the largest Indian producer of PET resin. The government today informed the Lok Sabha that it would soon review the Drugs and Cosmetics Act to ensure stringent measures in the wake of reports that certain harmful chemicals are used in baby products. “We are concerned about baby cosmetics. By mid year, we will hold deliberations with all states to incorporate strict penal provisions in the Act,” Health and Family Welfare Minister Anbumani Ramadoss said in reply to supplementaries during Question Hour. He said the government would bring about a change in the labelling pattern so that companies were liable to mention all ingredients on their products. Replying to the main question, he said the Commissioner, Food and Drug Administration, Maharashtra, had issued a show-cause notice to Johnson and Johnson seeking explanation for marketing their cosmetic products as baby products. Similar notices had also been issued to Wipro Ltd, Bangalore, Himalaya Drug Co, Bangalore, Dabur India Ltd, New Delhi, and Imami Ltd, Kolkata in respect of their products marketed exclusively for use of babies. India is fast emerging as a trading hub for diamond and gold jewellery, exports crossing $ 15.6 billion during 2004-05, registering about 30 per cent growth over the previous year. The country has fixed a target of $ 20 billion exports by 2007, and some companies are even planning to acquire a stake in the diamond mines in to ensure “sustainability and security of the trade,” said Mr Bakul Mehta, Chairman, Gem and Jewellery Export Promotion Council (GJEPC) ,here today. Mr Mehta said the industry was among the fastest growing industries in the country, and was projected to cross $ 20 billion exports by 2007. The Standing Committee on Finance of Parliament has expressed serious concern over deviations from the fiscal consolidation roadmap as laid down in the Fiscal Responsibility and Budget Management (FRBM) Act. “The Government should strictly adhere to the targets envisaged under the FRBM Act, except under extraordinary circumstances,” the 16th report of the committee tabled in Lok Sabha today, said. The Committee observed that the Section 7 (3) of the FRBM Act, 2003 mandates that no deviation is permissible in meeting and obligations cast on the Central Government under the Act, without the approval of the Parliament. The minimum annual reduction in the revenue deficit should be by 0.5 per cent of the GDP and in fiscal deficit should be by 0.3 per cent of the GDP. However, on account of extra resources that have to be shelled out as a result of implementation of recommendations of the Twelfth Finance Commission (TFC), the targetted reduction in fiscal deficit would by 0.2 per cent, while revenue deficit has been kept at the same level in Budget estimates of 2005-06 as in revised estimates of 2004-05 i.e 2.7 per cent of GDP. Expressing concern over the fact that the government has postponed the fiscal correction programme as envisaged by the FRBM Act, the Committee said that it was “not inclined to accept the plea given that the targetted reductions in deficits could not be adhered to because of the implementation of the TFC award”. “The additional expenditure on account of this (TFC) should have been anticipated by the government in advance and management of finances should have been done accordingly”, it noted. In another report pertaining to demands for grants of the ministry of planning, the Committee expressed reservation on the TFC recommendation that states are to raise loans without the inter-mediation of the Centre. “Travel agents across the country have decided to take back the decision of suspending the sale of tickets of Air-India and other European Airliners after getting an assurance from the management that our problems pertaining to commission cuts would be considered,” President of Travel Agents Association of India (TAAI) Balbir Mayal said here today. The strike had little impact on the carriers as they had kept open their reservation offices and selling tickets at “competitive fares”. A-I along with European carriers, Singapore Airlines and Asiana Airlines has decided to cut the agents’ commission from 7 to 5 per cent with effect from May 1 in line with the global practice of cutting distribution costs due to which agents had decided to ban the sale of A-I tickets from April 1. “We have received a letter from the A-I management inviting us for discussions on the issue,” Mr Mayal said. The company has opened its branch offices in China and the Netherlands and plans to open offices in other countries to further increase its exports. The group is supplying over 100 models of bicycles to the domestic and international market under the brand name of Hi-Bird. It is also exporting sports goods and other engineering products. Set up in 1994, the company has attained an annual turnover of Rs 100 crore. The company had introduced the first-ever bicycle in the domestic market that was fitted with traffic indicators and triple suspension. For this, the company’s name had been registered in the Limca Book of Records. The company had increased its manufacturing capacity to 6000 cycles per day. The Chief Executive of a South African arms manufacturing company, Denel, which is under investigation for alleged corruption in a deal with India in 2003, has been sacked following charges of financial mismanagement. The sacking of Victor Moche comes at a time when an anti-corruption unit is reported to be investigating allegations of corruption in the cash-strapped state-owned defence company’s sale of anti-materiel rifles and ammunition to the Indian Army in 2003. 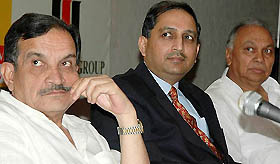 From Left: Haryana Finance Minister Birender Singh, President Assocham Anil Aggarwal and Punjab Finance Minister Surinder Singla at a seminar on VAT in Chandigarh on Wednesday. Quoting these statistics, the Haryana Finance Minister, Mr Birender Singh, advocated a rethink on zero-rating of CST. He stated that though this reform after VAT was high on the agenda, it was a “very serious issue for states’ finances and needed more deliberation”. Mr Birender Singh was addressing representatives of Assocham-PHDCCI at a national conference on “State VAT for a common Indian market — Issues and Challenges” held here today. Sharing his VAT experience since Haryana has had it for two years now, the Haryana Finance Minister said the state’s growth rate in the manufacturing sector was 7.5 per cent, higher than the national average of 6.6 per cent. He added that VAT spurs growth of tax revenue. “We allot 11-digit tax identification numbers and discretion in the matter of imposition of penalty has been taken away, removing the element of arbitrariness,” he explained. Punjab’s Finance Minister, Mr Surinder Singla, deliberated on how compliance cost of VAT could be reduced and administrative procedures misused by the officials. “We should also learn to trust the industry. The day is not far when industry in the non-VAT states will move over to VAT,” he said. Earlier, the alternate President, Assocham, Mr Anil K. Aggarwal, said that introduction of two-rate tax for VAT could reduce confusion in the minds of the traders, lead to better compliance and bring in more revenue for the government. India’s largest biotech firm Biocon Limited today posted net profit of Rs 198 crore and revenues of Rs 728 crore in 2004-05 and said, its profits in the current year would not grow as fast as sales but would maintain last year’s operating margins. The Banglore-based Biocon’s profits rose by 42 per cent over Rs 139 crore and revenues by 34 per cent over Rs 542 crore in 2003-04. It declared a dividend of Rs 2 per share of Rs 5. Biocon Chairman and Managing Director, Kiran Mazumdar Shaw told reporters here that profit growth would be lower due to higher depreciation for the firm’s new factories and “more importantly, Biocon’s plans to significantly increase R and D investment to support discovery-led research strategy.” Biocon’s exports this year jumped to Rs 442 crore over Rs 340 crore in the previous fiscal while domestic business shot up to Rs 271 crore from 201 crore. Gujarat Ambuja Cements Ltd today reported a marginal fall in consolidated net profit for the third quarter ended March 31, 2005, at Rs 155.6 crore compared to Rs 158.6 crore in the same period in previous fiscal. The board also approved issuance of bonus equity shares in the ratio of one share for two existing shares, subject to approval of shareholders and recommended a 60 per cent interim dividend (Rs 6 per share). It also decided to split the existing equity shares of face value of Rs 10 each into equity shares of face value of Rs 2 each. Vijaya Bank today reported an over seven per cent dip in net profit at Rs 380.5 crore for the year ended March 31, 2005, and declared a final dividend of 10 per cent. The bank’s net profit stood at Rs 411.3 crore during the fiscal ended March 31, 2004. Total income of the bank also declined by about one per cent to Rs 2,448 crore in 2004-05 from Rs 2,466 crore in 2003-04. The Board of Directors recommended a final dividend of 10 per cent in addition to an interim dividend of 15 per cent, taking the total dividend for 2004-05 to 25 per cent, Vijaya Bank informed the Bombay Stock Exchange. The record date for the purpose of dividend has been fixed as May 5, 2005. Wockhardt Ltd’s consolidated net profit for its first quarter ended March 31, 2005, dipped by six per cent to Rs 41.7 crore as against Rs 44.4 crore for the corresponding period last year. The company’s consolidated total income rose by 9.4 per cent to Rs 318.7 crore as against Rs 291.1 crore for the first quarter of last fiscal, the company informed the Bombay Stock Exchange today.